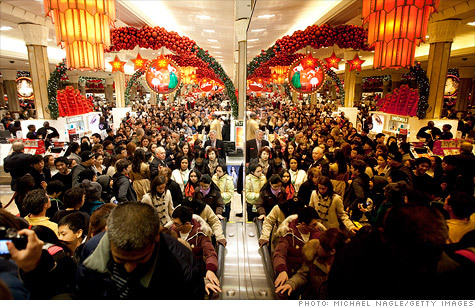 NEW YORK (CNNMoney) -- Preliminary reports for Black Friday indicate that retailers may have seen their strongest sales ever during the all-important kick-off to the holiday shopping season. "Retailers continue to stretch out Black Friday weekend by enticing shoppers with doorbuster deals weeks in advance," said Martin. Online sales were up 39.3% on Thanksgiving Day and 24.3% on Black Friday compared to the same days last year, according to IBM's (IBM, Fortune 500) Coremetrics, which tracks real-time data from 500 retailers in the apparel, department store, health and beauty and home goods categories. "This year marked Thanksgiving's emergence as the first big spending day of the 2011 holiday season with a record number of consumers shifting their focus from turkey to tablets and the search for the best deals," said John Squire, chief strategy officer at IBM's Smarter Commerce division.